Bike to Work Day is a wonderful opportunity to visit with a community of bicyclists: It’s a celebratory day, it gets new people involved and it showcases many of the bicycle friendly attributes of a city. So it was with great pleasure and excitement that I traveled to Connecticut by invitation of Bike Walk CT to celebrate on the special day. I started my visit to CT in the bucolic New England town of Simsbury. My bike advocate tour guides were Diana Moody, bike advocate extraordinaire and part of the Simsbury Bicycle Pedestrian Committee, and Karen Jenkins, former Board Chair at the League and recent founder of the New Haven Coalition of Active Transportation. Our first stop was Ti-Trikes in Simsbury directly off the Farmington Valley Bike Trail. The company manufactures titanium recumbent trikes designed with severely wounded veterans in mind. They have a power assist option, which made my test ride a lot of fun! The trikes are manufactured right there in Simsbury, CT.
Our next stop just a few miles down the Farmington Valley Bike Trail was Mitchell Auto Group, a Gold Level Bicycle Friendly Business. It was wonderful to see an auto dealership embracing bicycling to the extent that Mitchell Auto Group has. 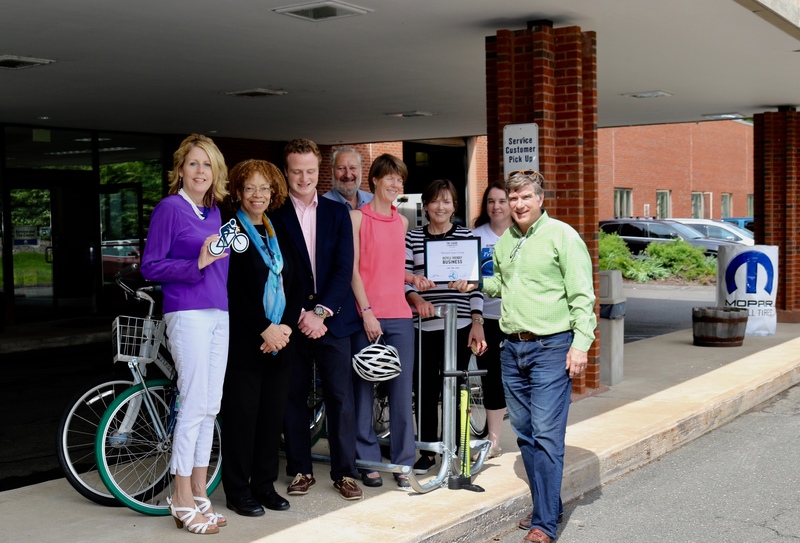 The business has hosted two LCI seminars in the past few years, supports Simsbury Free Bike, and encourages employees to ride to work. The Simsbury Chamber of Commerce was there to also congratulate Mitchell Auto Group on their award as well as a representative from the Simsbury Selectmen and Debbie Thibodeau, from Safe Routes to School Simsbury who is leading the charge on youth bike safety education in the community. It was amazing to me how well supported the bike friendly efforts of Simsbury are by so many different groups. That evening I made my way to Hartford for an open planning studio hosted by the Capitol Region Council of Governments. I met with local LCIs first and then kicked off a larger meeting with a presentation about the League’s tools and resources for state and local advocates. The presentation will be posted here in the coming days. The next morning festivities for Bike to Work Day started at 7am with many excited bicyclists arriving to the pit stop at the Old State House. Bike maps, Lime Bike (Hartford’s bikeshare system which is launching soon), bagels, coffee and many partner groups were included in the celebration. To me, it was Hartford and Bike Walk CT at its best. I am so happy to have been a part of it! Alison Dewey is the League's Education Director.